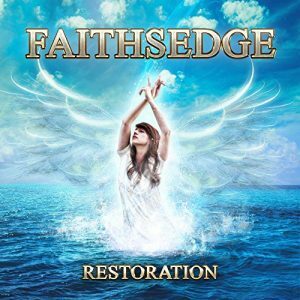 FAITHSEDGE is back with Restoration, their third and most melodic release to date. Fronted by mastermind singer/songwriter Giancarlo Floridia, the band returns with a stellar line-up featuring STRYPER bass player Tim Gaines, ACE FREHLEY/MR. BIG drummer Matt Starr and former DOKKEN guitarist Alex De Rosso. Both Keys and production have been handled by Alessandro Del Vecchio (HARDLINE/REVOLUTION SAINTS). The approach is very melodic with an old school feel: 80’s style hooks, big drums, slamming bass, epic keys and big production. At the same time the album keeps a current up to date feel with lyric content of today’s world mixed with a competitive metal feel. Giancarlo’s songwriting approach mixed with each members experience and skills takes the album to new heights . Check out a video for the track "Faith And Chris" on KNAC.COM right HERE. With different supergroups that come and go, FAITHSEDGE is more than just that, the band members worked together as a tight team and the result and chemistry show in the end result . The album is available on Scarlet Records in Europe and North America and on Spiritual Beast in Japan, Korea, China, Hong Kong and Taiwan.